Seacoast online and the Portsmouth Herald ran story on Dr. Warren talking about nutrition to "Marni's Army". The talk is scheduled for Thursday, April 24th tat 6pm. A local physician’s running group called “Marni’s Army” after Dr. Marni Nicholas, will learn about nutrition for runners from another local physician. 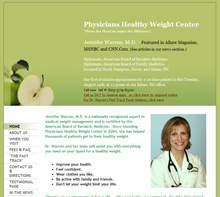 Jennifer Warren, M.D., founder of Physicians Healthy Weight Center in North Hampton, Dover, and Salem, NH, will speak before members of “Marni’s Army”, and the public is invited as well, Thursday, April 24th at 6pm at 155 borthwick ave, 3rd floor east building, Portsmouth, NH..
Dr. Warren was recently featured as a medical weight loss and nutrition expert in the national publication, “Martha Stewart Living Magazine”, in the January/February 2014 Winter edition. Since Dr. Warren left family practice in 2004 to focus exclusively on battling obesity , she has helped thousands of patients lose tens of thousands of pounds. Marni Nicholas, M.D., is an internal medicine physician with Appledore Medical Group Beacon Internal Medicine in Portsmouth. She participated in running in 2005, when she got the idea for the local running/walking program, “Marni’s Army”, which is now in it’s 10th year. The size of the group varies from week to week from 30 to 100 runners. The goal is to prepare for the annual Red Hook Memorial Day 5K run. Dr. Warren’s nutrition presentation is part of a lecture series with topics including proper running apparel, stretching, injury prevention, and treatment. Both physicians are part of a growing movement in medicine to focus on healthy lifestyles to prevent and control disease, and to help patients achieve healthy, balanced lives.